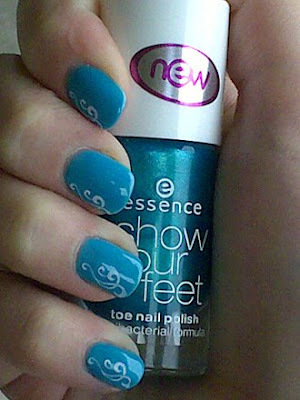 NOTD: blue with a tone - Cherry Colors - Cosmetics Heaven! Today I wanted to do my nails before I cut them. Why? Well they're kind of peeling off, cracking in some parts because they are too hard and so on. I think I can blame formaldehid in the Essie Fill The Gap nail polish. Oh well. Here is one picture, just for you to enjoy! I honestly don't have this color alone. I had to mix THREE colors to get it. A dark blue, light blue and a white color. After this picture, I took the nail polish off and put on another mixture (red coral and white) and added flowers. But my nails are now really short and remind me of buttons, so funny. Hopefully I'll manage to do some make up looks (I know I keep saying it), because on Friday I'll have my day off! YAY!